Adds functions for sending topics to people within FluxBB. There is no need to upgrade to this version if you do not upgrade your FluxBB installation. please delete all modifications in your PHP files, then install this one. replace your old files by the new ones and launch the installation via Mod Installer. PLEASE run the install_mod (it is modified to keep the "messages" table untouched if the mod is already installed). 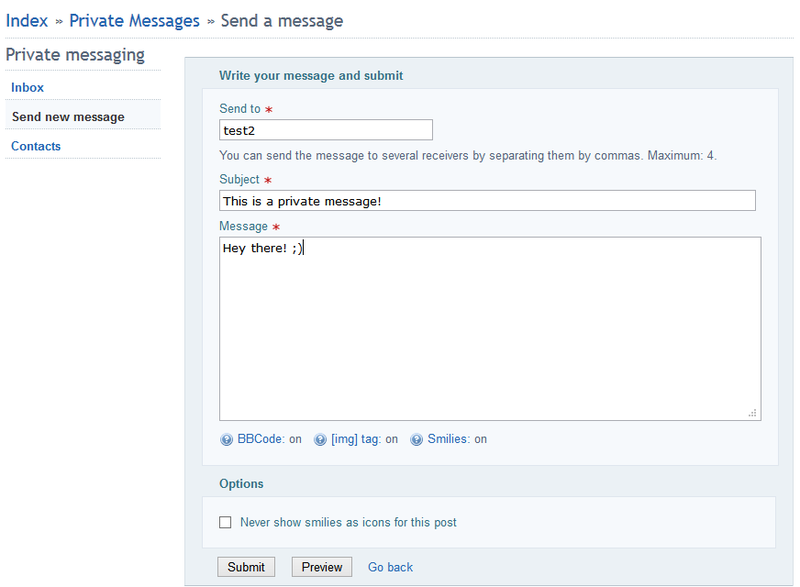 - Auto focus on "Send to"
- It is now impossible to send PMs to users that have them disabled. Icons are not showed in viewtopic anymore for them. by the new ones and launch the installation via Mod Installer. DO NOT run the install_mod (it would delete all the messages). Note that update is not required from v2.1.4 as there is no major change, only installation method. Instructions to update: replace all your old pms_*.php files by the new ones (if you upgraded from 1.2.2.4 this time or previously, replace your old files with the files from /Upgrade from 1.2.2.4 folder, otherwise replace your files with the files from /New installation folder). - Fixed a VERY annoying bug: impossible to send a message unless you are admmod. Spotted and fixed by Untermensch. Note: this version should be the last to support old outbox messages from 1. * branch. Note: this version will be the last to support old outbox messages from 1. * branch. - Some other changes that made this version an important update! Instructions to update: just replace these two files with the new ones. This version is the last of the 1.2.x branch. You can use it if you want, there is no known security holes or some problems like that, but I recommend to use the latest 3.x version available! Instructions to update : replace all your old pms_*.php files by the new ones.